A single entry blog about Billy, RJay, and Steve spending a day golfing near the Tetons in Jackson Hole, WY. Few places offer the majestic setting that Jackson Hole, WY offers. With the towering Teton mountains, running water, and abundant wildlife, it is no wonder that Jackson has become an international resort town. While we knew there wouldn't be a Tiger sighting in July in Jackson where Mr. Woods has purchased some property at 3 Creek Ranch, there was promise of great golf as the Gurus, R.Jay, and Steve heading up to 3 Creek Ranch and the new Snake River Sporting Club. 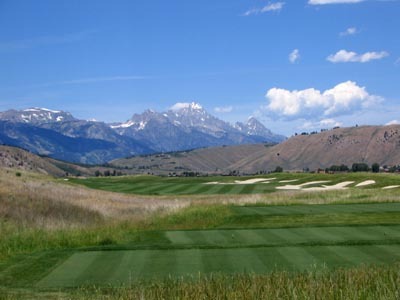 The Rees Jones designed 3 Creek Ranch hit the golf scene with a bang by finishing 6th in Golf Digest's "Best New Private Courses" category in 2006 and taking over the #1 ranking for the state of Wyoming. 3 Creek is everything you expect an upscale private course to be; phenomonal conditions, impeccable service, and a great overall experience. Scorecards are printed each day at the club with hole distances being calculated to the exact distance for that day's pin location and Pro V1s are used on the double sided 400+ yard driving range. The front nine is fairly flat and features a driveable par four followed up by a 500+ yard four par. The back nine features more elevation change than the flatish front nine and boasts some signature views of the Teton mountains. Quite playable with wide fairways and generous sized greens, 3 Creek can also test the strongest of players by stretching out over 7700 yards. While the match was close with everyone finishing within a stroke of each other, we're embarrassed to report an 89 was the winning score. It is amazing that the handicap index on an 89 at 3 Creek from the tips manages to be no worse than a 11.0 due to the fact that the stout rating/slope is 75.5/139. Snake River Sporting Club will be giving 3 Creek Ranch a run for its money as the best course in Wyoming and looks to represent the state well again this year on Golf Digest's "Best New Private Courses" list. Designed by Tom Weiskopf, the club's website quotes Mr. Weiskopf as saying Snake River Sporting Club is the best course he's designed in the United States. Pretty impressive when you consider his body of work. In fact, when we went to check-in we learned that we missed seeing Mr. Weiskopf by about 20 minutes as he was there playing the course that day to see how things were taking shape. The course setting is fantastic with the routing sitting between the mountains and Snake River with ample tree cover throughout. The bunkering features many jagged edges and the 2nd hole features Tom Weiskopf's "pet hole"; the driveable par four. As fun as driving a par four can be, you're ball will think it has loaded onto a Six Flags roller coaster when it finds the green. I'm not sure I've ever played a green with more severe undulations, although Donald Trump's redesigned 12th green at Trump National Los Angeles may give it a run for its money. Finding the correct portion of this green very well may be the difference between a pretty birdie and an ugly double bogey. One of the coolest holes of the day was the short par three 4th hole that featured a deep, sod stacked bunker. R.Jay found his way into the intimidating bunker but managed this nifty escape shot that nearly found the bottom of the cup. Stretching out to over 7500 yards, Snake River Sporting Club has plenty of girth to challenge low handicap players while offering multiple tee boxes to assist the higher handicap golfer. No matter what tee box you play from though, you are going to have to place your shots well throughout the day because there is little forgiveness found on the course. All in all, it was an impressive 36 holes of golf for the day. 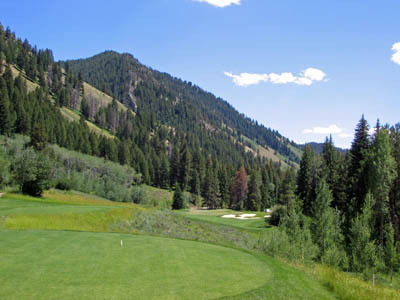 The Jackson area has really stepped up its quality of golf over the last couple of years with these fine tracks that now accompany the already acclaimed Teton Pines and Jackson Hole Golf and Tennis Club courses. Just across the Idaho border 30 minutes from Jackson, the towns of Victor and Driggs are starting to boom with new courses as well. The first great installment was the Headwaters Club at Teton Springs in Victor where the great Byron Nelson assisted in the course design. Next, Hale Irwin just completed his reversible routing at Teton Reserve with a David McLay Kidd (designer of Bandon Dunes) course and Greg Norman course both in the works as well. Amazing additions to an area that is lucky to golf from about Memorial Day to mid-September.